Here is a set of snaps of the Lavac installation on Defyn Gravity and a little write up. Plain and simple, the view of the Lavac installation in Defyn Gravity. 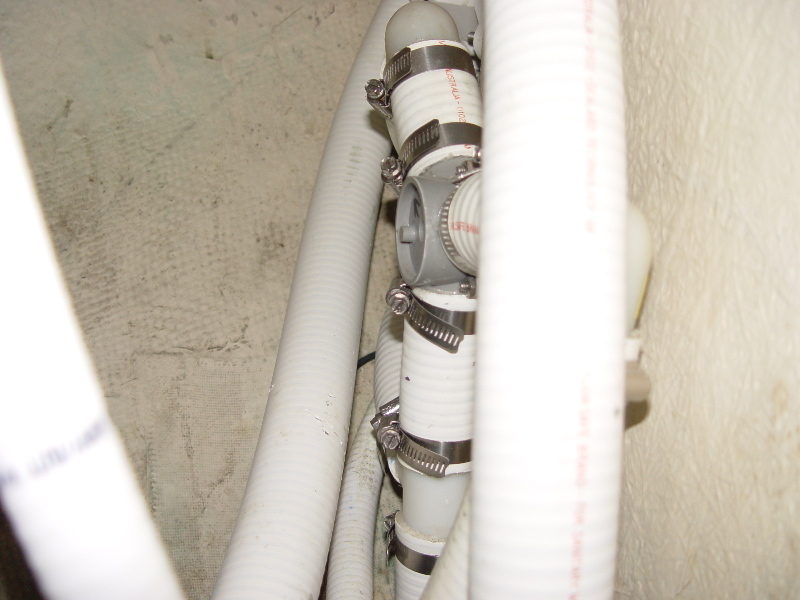 You can see the location of the pump as well as the basic plumbing. 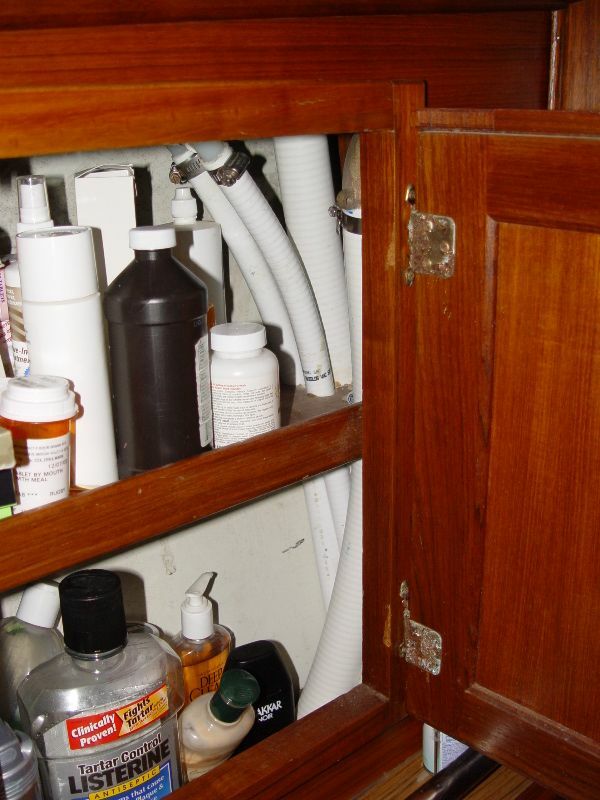 Note that there is no hose running through the bulkhead on the right. Also note that the brownish gunk at the seam where the fiberglass meets the floor is not dirt but varnish from the previous owner’s somewhat mediocre job. To valves on the left control the from where and too where for the single pump. 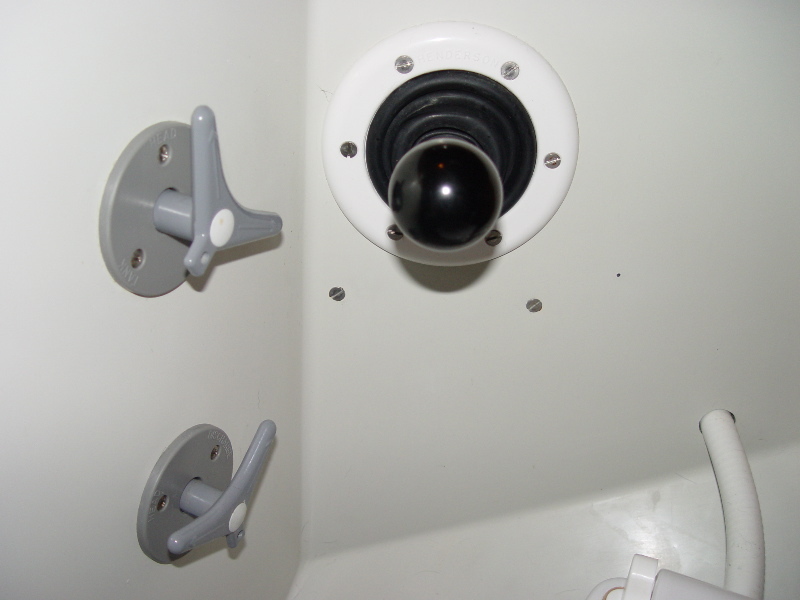 The bottom valve allows the pump to either pull from the bowl itself or the holding tank. 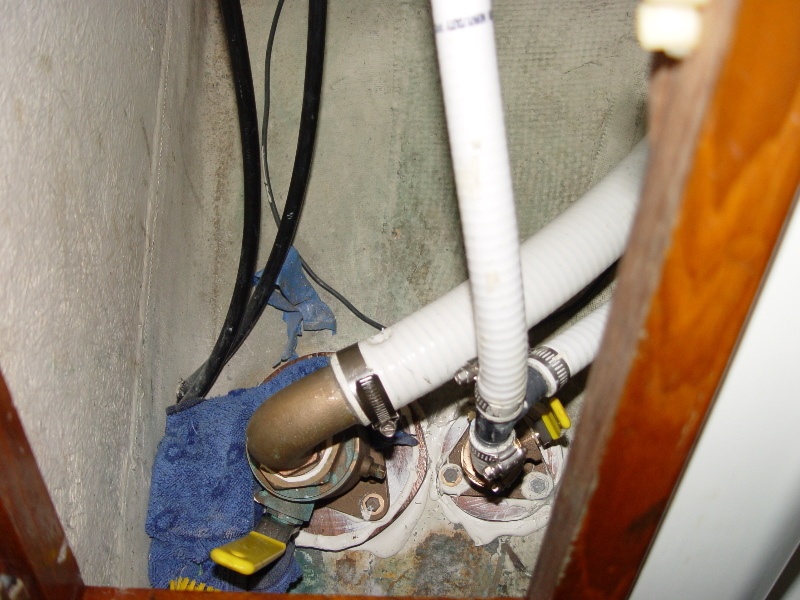 The top valve determines where the outflow from the pump goes, to the tank or overboard. Yes, it is possible to pump from the tank to the tank. I haven’t gotten around to painting anything to cover the filled holes from the old bowl. Detail of the pump and valves, see above. 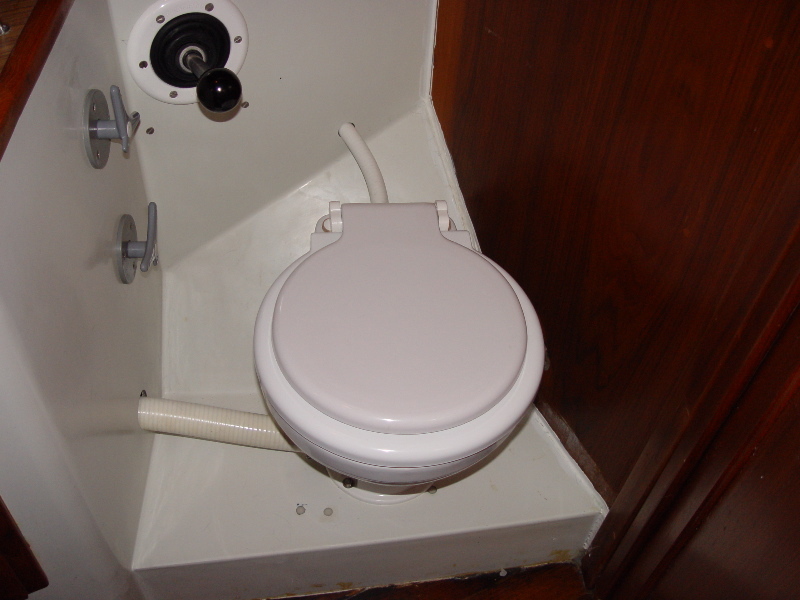 The handle with knob is from the bilge pump, cut down a bit to fit better. The bilge pump has the handle that came with this pump. Geez, the camera is so good that I took these in the dark and didn’t realize there was a rag in there! 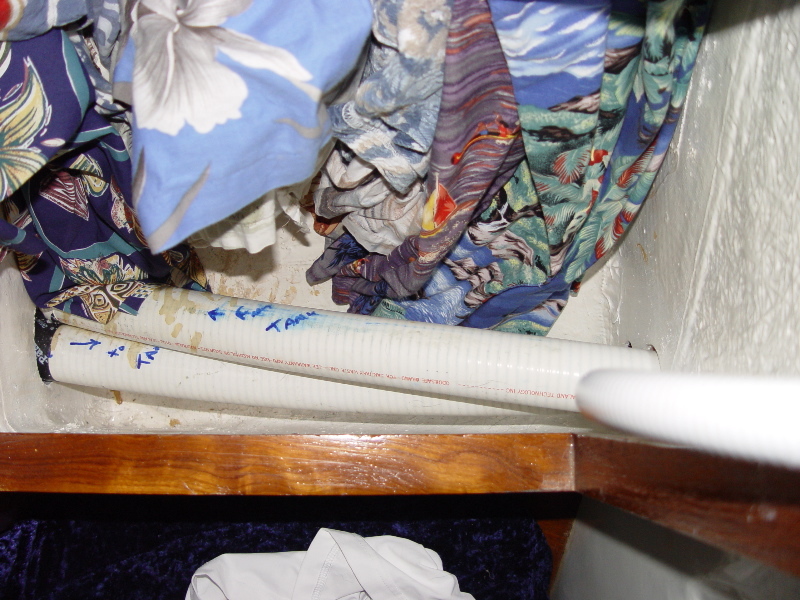 Oh well, here is the under-sink detail, you can see the T in the sink drain which feeds the bowl. Double hose clamps were not used but not for lack of trying. I simply couldn’t get the hose on the barb far enough trying every trick in the book. Thru-hulls are of the self-supporting type with integral valve. Is a detail of the back-side of the valves. Although a bit tight, they are pretty servicable, when that dreaded time comes. The pump as well has access, although once again, tight. You can only imagine what a bear it was to snake the sea-land hose around back there. A really quick shot of all the siphon breaks (for the thru-hull and the bowl intake) as well as the deck pump-out line (I relocated the deck fill to accommodate this). You can also that at this stage of the game I got a tad tired of the whole ordeal and haven’t properly mounted the siphon break. With that sea-land hose it isn’t going anywhere but still. The small tube is the required siphon break for the water headed to the Lavac bowl. #7 The proof is in the pudding. Missing from this pictorial are shots of the holding tank. It’s the original 8 gal. located under the little convertible seat in the stateroom. It’s not very exciting but I pulled it, cleaned at, and put about 5 coats of slightly thickened west system on it, there were areas where is seemed a bit thin. 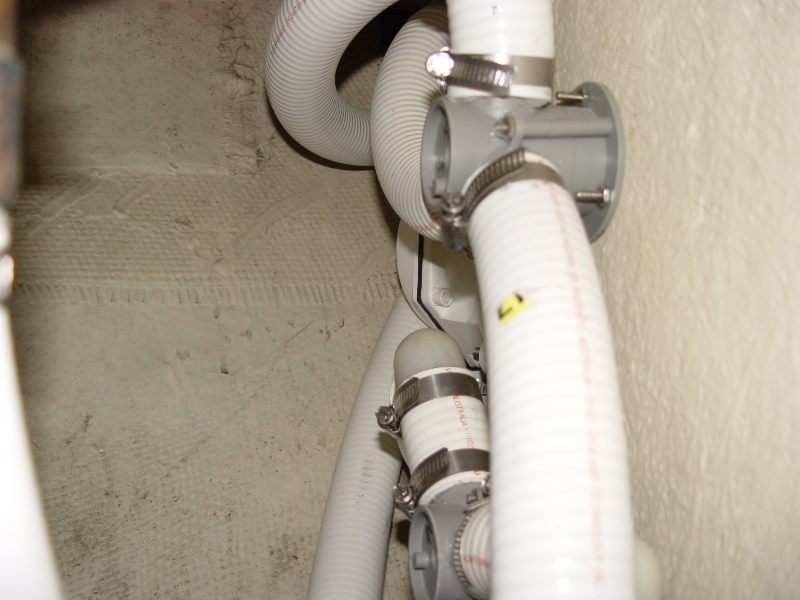 I also had to replace all the fittings, and used PVC pipe which was bonded and then glassed to the original fittings. 3M 4200 holds the tank in place. The original pump is no longer needed and was scrapped. All in all it took about 3 days of work and a lot of very expensive hose. However, it doesn’t stink, it doesn’t leak, and I got two very important storage areas back. It also made the fiance who lives aboard with me MUCH HAPPIER. Therefore it was a complete success!